Part of being a big girl in New York is coming to terms with the fact that your time (and life, by extension) is not your own. Second is learning how to manage your budget so the meager time spent out of the office can be enjoyed to the fullest without breaking the bank. In my case, this meant the weekday soup diet. When I first started my job, I was assigned to a position in my company’s West Village office. This was a relief because as a born-and-bred New Yorker, there was nothing more horrifying than the prospect of commuting to Times Square everyday. One thing, however, that I did not foresee was West Village take-out joints charged $13 for one salad. In our airy, jean-friendly downtown digs on Hudson and Leroy, three of us from the same training program sat together in what would later be coined as Slave Row. And every afternoon in Slave Row my friend Lauren and I would lament our current lunchtime financial ailments as we watched Roma, our third member, eating her mother’s hand-packed lunch from home. I too was still living with my parents at this point, but since my mother didn’t want me there in the first place, I wasn’t going to push my luck by asking her to work a brown bag lunch into her daily routine. By the end of every month, when Lauren and I had blown through our pay checks and were sustaining ourselves on ramen noodles and free wine and cheese from gallery openings 20 blocks north in Chelsea (maybe that was just me), we would both notice each other reaching for the same secret desk drawer, the one where that can of soup purchased during more prosperous weeks prior lived, and where it had been sitting ever since. Soon we came to embrace the soup diet and integrated it into our lunchtime menus at the beginning of the month so that by the end Lauren didn’t have to go home to ramen and I could stop gorging myself on stale Carr’s crackers and bad art. Eighteen months later, we’ve all been promoted from the program and our salaries have begun to be the kind that you can live on. But to celebrate the early days and laugh at our humble beginnings, I invited the gang over for a weeknight soup dinner that would have put the old can of Progresso to shame. Unfortunately, lest you forget the first sentence of this post, the girls were forced to cancel last minute due to those added responsibilities that new salaries tend to provide as a constant ball and chain. I improvised by inviting a few of my friends. They weren’t my coworkers, but hey, they’re someone’s. NOTE: If you are making this for a vegetarian, use a separate pan for frying the bacon, and make sure to use veggie stock instead of chicken. Preheat the oven to 350°F. 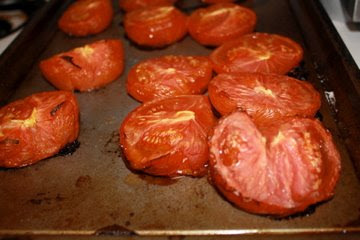 Lay the tomato halves on the pan cut side up and drizzle with olive oil and salt. 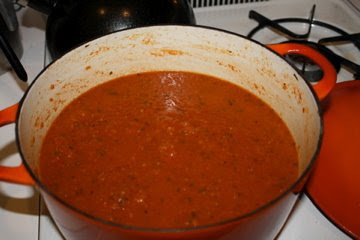 Roast in the over for 40 minutes, until the tomatoes have begun to caramelize but are not blackened. In a large Dutch Oven or stock pot, fry the bacon strips over medium-high heat until dark brown and crispy. Remove and let drain on a paper towel. Add the onions and 1 tablespoon of olive oil to the pot and sauté over medium heat until translucent, scraping up any remaining drippings form the bacon. Add the garlic and the red pepper flakes and cook for another 2 minutes. 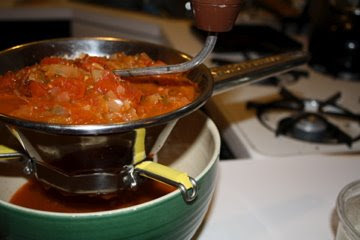 Add the diced tomatoes, stock, and tomato paste. When the roasted tomatoes are finished, add to the pot. Simmer uncovered for 20-30 minutes. TIP: the soup can be made up to two days in advance and kept in the refrigerator. If you are going this route, wait until the day of to fry the bacon. 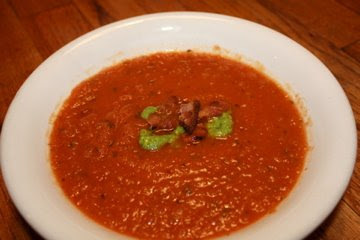 To add a bit of flavor to the soup, add ½ tablespoons or so of the fat rendered to the soup when you reheat it. Using whatever tools you have available, puree the soup. I prefer a food mill (otherwise known as a mouli, pictured above) or a ricer since it keeps the soup relatively textured, but a food processor, blender, or immersion blender work as well. Set the oven to broil. Slice the ciabatta down the middle. On a baking sheet, lay both pieces cut side up and drizzle olive oil on the top half of the bread. Put the bread in the oven for a few minutes, until the bread is slightly crispy on the top but not yet beginning to brown. Remove from oven. Slather the pesto on the bottom half of the bread. You can be as generous as you’d like. Lay the cheese slices over the pesto in an even layer or two. Replace the top piece of ciabatta and press down so the sandwich sticks slightly. Return to the oven for 3 minutes or so, until the cheese has melted and the outside of the loaf is nice and crispy. I’m a firm believer that a salad is only as delicious as its dressing. I’m a total condiment junky, so this makes sense. Unless you are planning on serving a salad as the main component of your meal, there is no need to get too crazy by adding everything but the kitchen sink. I rarely use more than two extra ingredients for my side salad (usually just tomato and avocado), and the one below is solely composed of good quality greens. You can easily add anything you like, but the power is in the dressing. Place the clean, washed spinach in a large salad bowl. Combine remaining ingredients in a small bowl and whisk together. Right before your guests arrive, toss the dressing with the spinach. Serve on a small side plate with the pesto grilled cheese. What other kind of dressings could I use if I was trying to stay away from yogurt? Is there anyway to incorporate these flavors into an oil based dressing, or what other bases could I substitute? Magazine club, LOL…But why not something even shorter than a book or a magazine? I want to start a fortune cookie club. We can sit around read our fortunes out loud. And eat the rest. Oh man this looks amazing. I'll have to make this the next time I have friends over. Love your blog keep it up!